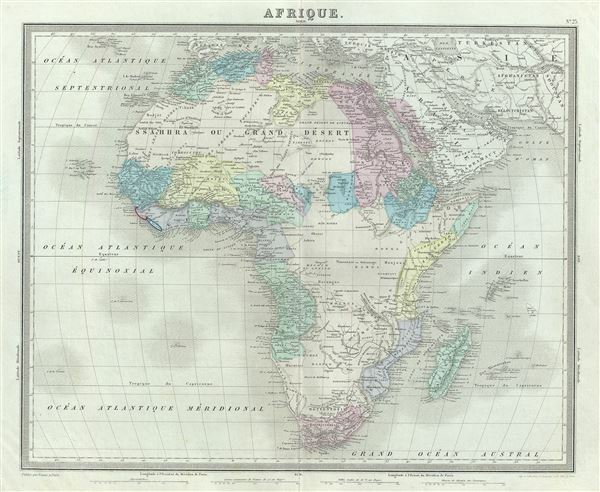 This is an attractive 1874 map of Africa by Ambroise Tardieu. It covers the entire continent in considerable detail considering the level to which it was explored at the time. It extends from the Mediterranean south to Cape town, including the island of Madagascar. Part of adjacent Arabia and Turkey are also featured. Though European colonies and outposts dot the coastlines, much of the interior remains unknown, even speculative. Neither Mt. Kenya, first sighted by western explorers in 1849, nor Lake Victoria, the existence of which was confirmed by Stanley in 1862, appear on the map. Lake Marawi appears in its embryonic form. Numerous African tribes and nations are named throughout. This map was prepared by Ambroise Tardieu and issued as plate 23 in his 1874 edition of Atlas Universel de Geographie Ancienne et Moderne.